PALS members Tess Midkiff (right) and Diana Wellman (left), along with “Bridge Lane” co-author Jennifer Morgan (center), observe the new book that is displayed in the West Elementary School Library thanks to PALS and The Portsmouth Rotary Club. The wonderful smell of books in the library to many people is just as good as the scrumptious smell of great food to others. And there are still a lot of people who feel that going to the library is as great and special as going to the mall to buy new clothes for the first day of school. It has been said that children are not getting the love for books instilled in them, like people of older generations. However, the PALS (Portsmouth Area Ladies, Inc.) do their best to see that this does not happen. For several years, they have donated books from different authors for various reasons to the local library and the local schools. This year PALS joined with another local group to help share their generosity and found a very special book to make a large donation to schools in the local area. 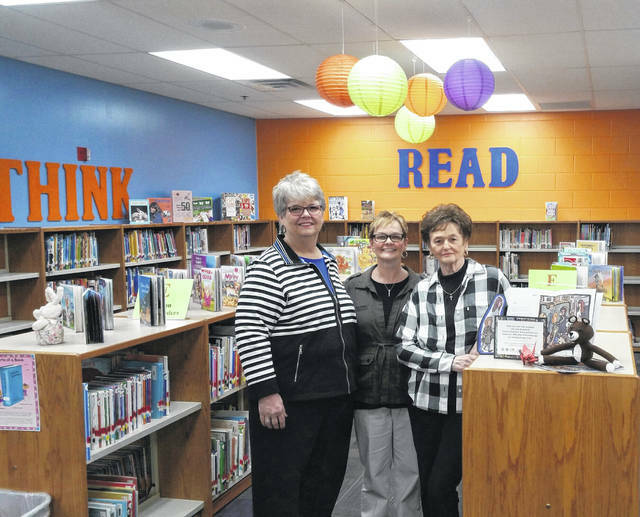 PALS women’s volunteer group and the Portsmouth Rotary Club have joined forces to provide Bridge Lane, a locally-written children’s book, to area elementary school libraries. Book sets were delivered in February to all Scioto County elementary schools, including Notre Dame, STEM and the Vern Riffe School. This book was written by West Elementary school teachers Jennifer Morgan and Jessica Lincecum and illustrated by local artist Charlie Haskins. The book was intended to raise awareness of homelessness and teach youngsters about compassion and other important life lessons. It was designed primarily for grades three through five, according to the authors. Bridge Lane tells the story of a girl named Anna and her mother struggling with problems of homelessness and demonstrates the values of strength, courage and faith. Morgan and Lincecom say they were inspired to write the book by their passion for homelessness and their love of children’s books. Haskins, a painter from Portsmouth, enjoys creating pictures that tell stories. Along with illustrations, he creates artworks like murals and custom portraits. His artwork can be seen at Haskins House on Second Street in Portsmouth. Awareness is so important to young generations of today, and this book is one some may not have thought of as being important, had these local ladies not gotten together to write the book and then put it out there, allowing the two local groups to choose this book to share with so many children across the area. Local people helping to bring awareness to a problem seen in our area, that maybe some children are not even aware homelessness exists here where they are living, in such a visual way through books, is a tremendous way to share not only a love for books, but also a compassion for others at the same time. Putting together the ladies who compassionately wrote the book, the artist who put the words into pictures, then two groups sharing that book across the county, and with all of them being local, what better way is there to share a book with all right here at home.